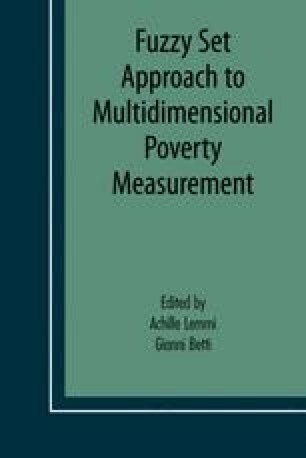 The aim of this Chapter has been to show in what sense fuzzy set theory can be useful in operationalizing multidimensional well-being analysis based on the capability approach. With their capacity to make formal logic and verbal formulations much closer to one another, and to establish close connections between theory and data analysis, fuzzy methodologies seem to be a useful and flexible tool for operationalizing the capability approach while preserving its richness and complexity. The Chapter has discussed the three main phases of operationalization description, aggregation and inference - while seeking to underline the main conceptual and methodological issues that could arise from a capability perspective. What is worth emphasizing is that the application of fuzzy sets methodology does not represent a sort of mechanical exercise or standard algorithm, but requires a fundamental interpretative effort for each step, with the aim of establishing a close link between the contents of the theoretical concepts under examination and their representation through fuzzy set theory. In order to take full advantage of fuzzy methodologies in the operationalization of the capability approach, many other aspects remain to be investigated - e.g. comparing different methods for constructing membership functions, testing different classes of fuzzy operators, making use of fuzzy inference systems for estimating capabilities instead of achieved functionings, and so forth. However, the affinity between fuzzy methodologies and the capability approach seems to be a very promising one.